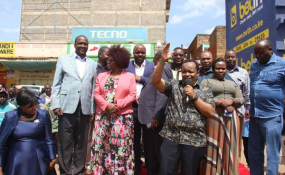 Nyeri Town MP Ngunjiri Wambugu (centre) introduces a group of leaders dubbed ‘Kieleweke’ in Nyeri town where they addresses a rally on April 7, 2019. In Nairobi, 14 MPs allied to President Kenyatta and ODM leader Raila Odinga -- drawn from Jubilee Party, Kanu and ODM -- branded themselves as 'Team Kenya' and voiced support for the handshake as they called for intensified crackdown on graft. In Kakamega, DP Ruto said he was counting on support of the church to deliver on the government's pledges. He led 10 politicians, including a governor, Senate Speaker and MPs in warning that they would not allow propaganda and falsehoods to derail the government's agenda. Sunday's political activities depicted the widening rift in Jubilee even as Dr Ruto put on a brave face, declaring that all was well and that members were fully behind President Kenyatta's leadership. The division appears to have sucked in government officials as top Interior ministry officials and police skipped Dr Ruto's launch of a police station in Nakuru on Saturday. In Murang'a, Gatundu South MP Moses Kuria announced he was in the process of registering a political outfit for the Mt Kenya region. "We erred when we dissolved our party The National Alliance because Jubilee is an amorphous vehicle and we can't plan about Mt Kenya through it. I shall register a political party that Mt Kenya leaders will use to plan for our future stake in government," he said. Political analysts say President Kenyatta's studious silence has only served to raise tensions within his party. Yesterday, Jubilee secretary-general Raphael Tuju said the two political formations are "mere creations and hot air". "None have given indications that they are no longer members of Jubilee and ventured into other political affiliations and I treat such formations as fiction," Mr Tuju said. But the 'Kieleweke' team who joined opposition MPs in Mwiki, Kasarani, for a fundraiser hit back, accusing the Ruto team of disrespecting the President who had called for a ceasefire with Mr Odinga. They threatened to de-whip their counterparts linked to the DP for undermining President Kenyatta. Mr Kutuny said the government should return security detail to Dr Ruto's allies "so that they can stop crying at night." Ms Wamuchomba said: "The fact that we can sit together with those who were on the opposing side and discuss matters affecting Kenya is such a miracle. That was only possible because of the handshake." "Team Kenya is about peace, uniting the country and developing our nation," she added. Mr Kamanda said: "The only problem in Jubilee is that there are those who are against the war on corruption and fighting the handshake and those supporting the war on graft and handshake." Separately, Kajiado Governor Joseph Ole Lenku said Jubilee should be protected from the effects of the political truce between President Kenyatta and Mr Odinga "which are threatening to disenfranchise some party members." Kiharu MP Ndindi Nyoro of the 'Tanga Tanga' group accused his colleagues of "working for former Mr Odinga and his Nasa outfit". "Furthermore, majority of them are former ODM advisers and leaders. We have been clear on the fact that Nasa movement had a sinister motive in the handshake and clearly this is a repeat of what happened after Kanu/LDP merger," Mr Nyoro told the Nation. Speaking at Saba Saba Catholic Church in Murang'a, Senator Irung'u Kangata said Jubilee Party is heading in the wrong direction. "Our party is heading in a wrong direction because the two factions of 'Tanga Tanga' and 'Kieleweke' teams are creating hatred among their colleagues who they perceive to be in rival camps," he said.